When driving a taxi, you never know who you are going to pick up. Sometimes it’s a cage fighter with a black and blue face, other times it may be a newborn with its mother or even a quantum mechanics physicist calculating the future of Oregon in another hundred years. The possible categories are as diverse as the people that you drive, but most of time they can be sorted out by subject and catalogued for future reference. The subject that I pulled from the file for today is “Wheelchair Stories”. Shorty was the first double leg amputee that I drove, shortly after I started hacking in 2004. 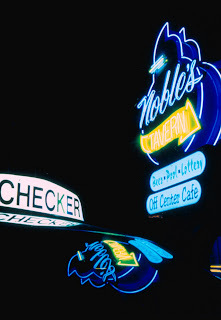 It was on a Saturday night, and I picked him up at “Von’s Corner”, shortly after midnight. 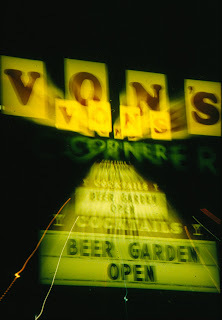 Von’s used to be called the “Lana Tavern”, since Lana Street dead ends into its parking lot. It’s one of the rougher neighborhood bars in Salem, where fights occasionally occur, and customers may be singing Karaoke in Spanish. Shorty was waiting outside, where the bouncer had placed him after he caused an altercation inside, and the bar tender called him a cab. I saw him sitting there, in his wheelchair, when I pulled into the parking lot. “Did you need a cab?” I asked him. Since I never helped a legless person get in a van before, I got out and asked him what I could do. He said that I could lift him up and place him on the seat, but I couldn’t get a good enough grip while he was sitting in the wheelchair, so I got back in the driver’s side and leaned over the passenger seat, to reach for his hands. Once we locked hands, I began pulling, but it was like dead weight. I had to go back in the bar and get someone to push him while I pulled, and finally got him inside. After I collapsed his wheelchair, and put it in the side door, I got Shorty’s destination and started driving. Shorty’s real name was Ray, he told me, and he said that he lost his legs because of agent orange from when he was in Viet Nam. He said that it took twenty-five years for the cancer to finally do its work, but now all he had left was to wait to die. So he got drunk every day on the disability that the Army gave him, and lived with his brother. When we got to his place he didn’t have any money, but the fare was only $5.10, so I told him not to worry about it. After I got out his wheelchair, I managed to get him in it and wheeled him to the side door that had a ramp. Another double amputee that I drive every so often is Jim, who likes to get drunk at Nobles on the North East corner of Center and 17th Street. Jim taught me the best technique for loading a legless person into a van. After opening the sliding side door, you push the wheelchair right up to the portal, and the wheelchair seat is level with the van’s floor. Then Jim would scoot from the wheelchair into the van. Of course he wasn’t on the seat, so he couldn’t put on a seat belt, but I wasn’t going to worry about it. Jim told me that he lost his legs because of a logging accident. When I got him home, he paid me and I had to push his wheelchair into the garage, where there was a ramp into the house. Then one Saturday afternoon, I got a call for Fred Meyer’s, in Keizer, and when I got there, I saw a man in a wheel chair, at the main entrance. He was without legs, but agile, and swung himself into the front seat of my sedan by grabbing the lip around the door opening, on the roof. I asked him how he lost his legs, and he said that one day he broke them both in a car accident, and they were reconstructed with pins. Then one day, five years after the accident, he blacked out, and when he woke up, his legs were gone. My favorite wheelchair taxi cab story didn’t happen to me, but to the old number 44, Robert Scheiderman, who has since then retired. He told me that one day the boss called him into the back office, before he started his shift, to question him about a complaint that someone called in. It seems that one day he picked up a group of people, who included a crippled man in a wheelchair. There were 6 people, and since he had a sedan, the seat belt law only allowed him to carry 4 of them. Since the apartments that they all lived in weren’t that far away, 2 of them started walking there. Number 44 had to collapse the wheelchair and put it in the trunk, so it took a while for him to get going. When he arrived at the apartment complex, they paid him and, he took the wheelchair out of the trunk, but the crippled man, said that he could still use his legs some, so he wanted to hold onto his wheelchair, and try walking to his apartment. He was struggling and nearly fell over a couple of times, but managed to make it. Number 44 said that he stood there watching him, when the other two people who were walking came in sight. Then he drove off. One of the people called the taxi office to complain about the driver who took away a crippled man’s wheelchair and made him crawl to his door. I remember when I attended L.I.F.E. Bible college, which at the time was connected to Angelus Temple, in the Echo Park District of Los Angeles. One of the most famous faith healers of the 20th century, Aimee Semple McPherson founded them both. There was an area that contained discarded wheelchairs, crutches and braces, left behind after her miracle healings services. Too bad sister Aimee didn’t become a cab driver. I am still laughing from the ending... It is amazing the renditions of stories people come up with, such as the case with the stolen wheelchair. You never know what to expect when your dealign with peole. Good luck Taxi Man. Ironically a few weeks later I ended up leaving a drunk crippled man laying on the sidewalk, after he told me to just let him crawl up the steps.